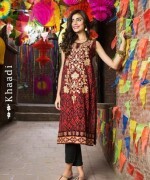 Here we are with this Khaadi eid collection 2015 for women! We are sure that all of you must be waiting for this Khaadi Eid collection 2015 because all of you only want to wear this collection on all the 3 days of this eid 2015. Now, all the girls and all the lovers of this hub do not have to wait any more because this collection will be right in all the outlets on June 13 2015. Just start saving up the money because few of the days left now, we are sure that right on the day 1 of the launching of this collection, the stock will be ended up. If you want to grab some of the nice two to three dresses from this clothing brand then you have to be the first one to visit its outlet. Now, moving on with the details of these dresses, this collection has these embroidered Eid dresses, it has these printed outfits too. Amazing colors have been put up by this hub and you will be having these best of the Eid outfits in the colors like red, aqua, maroon, black and in many other bright kind of shades. 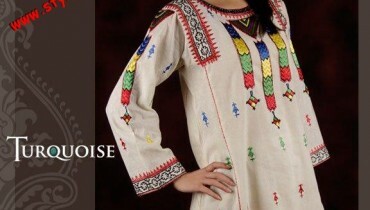 Join the face book fan page of this Khaadi hub and know more about all of its collection lines. If you think that only this collection line will suit on you then make sure that you do make a buying of it as soon as possible the minute it will be launched! Just cancel all your plans right on the 13th June 2015 because you will be visiting the outlet of this clothing brand. Check out the pictures and let us know too that which is the best Khaadi Eid dress so far in these pictures?